Perhaps it’s not surprising, but Apple has a patent on the iconic “breathing” pattern used for the sleep indicator LED on all their computers. Recently — for a personal project — I wanted to see if I could replicate this effect. It turns out that I wasn’t alone. Ladyada tried to reverse engineer the pattern a few years ago. Unfortunately, she stopped short of providing anything — like code — that the lazy web surfing Arduino hacker might use to recreate the effect. That’s the purpose of this short tutorial. The Apple patent claims that the breathing pattern is a simple sinusoid, but observation of one’s own (heavy) breathing will show that the pattern is a little more complicated than that. Maybe a sine wave works for Apple, but it doesn’t look quite right to me. In my own breathing, I tend to ease in to a fast inhale, and stop suddenly before easing out to a fast exhale. Also, the period between inhalation and exhalation happens to be shorter than the period between exhalation and the next inhalation. 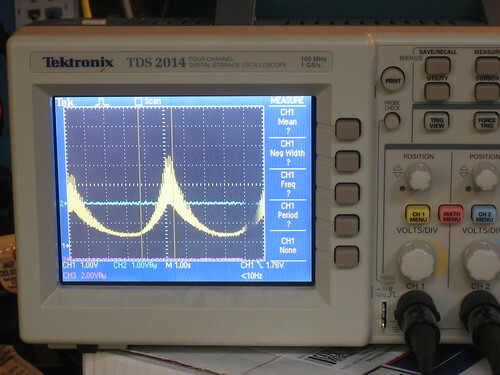 This is not a simple sinusoid, as the oscilloscope plot from Ladyada’s own investigations will attest. The plot of f(x) = esin(x) has wider “troughs” (periods between inhale and exhale) and narrower “peaks” (periods between exhale and inhale), more accurately matching natural breathing patterns. As a simple experiment, try breathing “sinusoidally” and you’ll see how unnatural it feels. For my own experimentation, I used the ubiquitous Arduino. The Arduino supports analog output using pulse-width modulation (PWM) mapped to integer values from 0 to 255. To recreate the breathing LED, this means manipulating the original equation f(x) = esin(x) such that the amplitude fits within the PWM range. Swap x for the number of seconds that have elapsed, and map the above equation to PWM output on any supported Arduino pin, and you have the beginnings of a breathing pattern. The problem is that the frequency may be too high or low (depending on your preference), and so the breathing will appear fast or slow. Easy enough: Multiply x by any value to adjust the frequency. I like π/2. You might be asking: Is it really that big of a difference? Wouldn’t a simple sinusoid suffice? To answer the latter question: yes. To answer the former: the difference is noticeable, but only slightly. Steve Jobs was a notorious perfectionist. I like to think that he would’ve cared about such things.